With options to speed up a cycle or to target a particular dryness level, the FRIGIDAIRE FAQE7011KW helps the user achieve his desired laundry results. Customization is backed up by user-friendly features such as Express Select Controls and silent operation. Drying the laundry is not only customized but also pleasant. The electronic Moisture Sensor detects the presence or absence of moisture in the load. With the knowledge of the degree of wetness and dryness, the appliance can provide the target dryness level that the user desires. 7 cycles, 12 options, 5 temperature levels and 4 dryness levels should all together provide enough options for customization to the user. The Save Your Settings feature will automatically keep a record of the settings used the last time. The 7 cycles include a Quick Cycle, which allows a load to dry in just 25 minutes. This cycle is especially recommended to households with several members or with extra busy members. The SilentDesign will make drying the laundry pleasant. Because of the quiet operation, the user can perform other duties that require concentration. For example, a user can dry the laundry while doing homework or while preparing a report for his job. DrySense Technology ensures that the FRIGIDAIRE FAQE7011KW dryer preserves the condition of the garments. This technology not only applies precision drying but also decreases the creases on the garments. So if a damp dryness level is used in combination with this technology, the user do not have to spend a lot of time with ironing duties. The exterior of the product is in Classic White. Variations, at least in terms of color, of the FRIGIDAIRE FAQE7011KW, however, are also available in Classic Red and Classic Black. The drum can accommodate up to 7.0 cubic feet. This means that the dryer is one of the most spacious in the market. The large capacity allows the user to finish drying the laundry in less time. The FRIGIDAIRE FAQE7011KW dryer is stackable with a compatible washer, saving space in the laundry are. Another way the dryer saves space is through the use of a reversible door. The door allows maneuvering in both of the main directions. Express Select Controls are easy to use. One push of the button will select an option or initiate an action. The FRIGIDAIRE FAQE7011KW dryer has one of the largest capacity in the market. There are some space-saving features that allow this dryer to become part of even small laundry areas. Fabric care is one of the high points of the dryer. Garments are thoroughly dried without being destroyed. User-friendliness make the FRIGIDAIRE FAQE7011KW dryer ideal not only to newbie users but also to users who just want to get right to doing the chores. 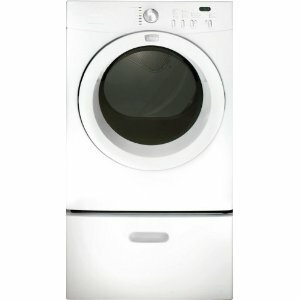 The FRIGIDAIRE FAQE7011KW dryer is not Energy Star certified.